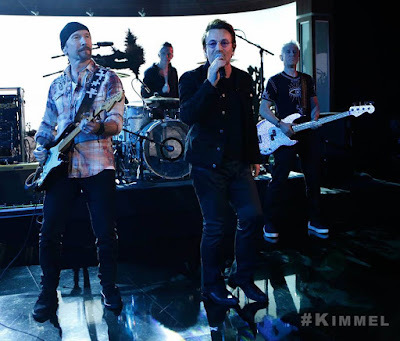 U2 performed their 1987 classic, “I Still Haven’t Found What I’m Looking For”, on ABC-TV’s Jimmy Kimmel Live on May 23 and official video from the program is available online. The band were on hand to promote their recently-launched North American tour, which marks the 30th anniversary of “The Joshua Tree” and sees the Irish rockers playing the album in its entirety for the first time. U2 joined Kimmel for an extended and wide-ranging conversation, discussing everything from their early days to getting advice from Bruce Springsteen, to this week’s terrorist attack at an Ariana Grande concert in Manchester, UK, to the possibility of a new album. U2 will release a series of 30th anniversary reissues of “The Joshua Tree” on June 2. U2’s fifth album, “The Joshua Tree” spawned three hit singles (“With Or Without You”, “I Still Haven’t Found What I’m Looking For” and “Where The Streets Have No Name”) on its way to selling more than 25 million copies worldwide, including 10 million in the US alone.